"If you can run 3 miles, you can run a marathon." It was 1998, and I was in my Sophomore year at Cornell. A good friend of mine had decided to do the NYC Marathon that November. I was telling my mother, a two time marathon runner, that I was considering it too. When she made the above statement, I looked at her like she had three heads. "HOW does 3 miles equate to 26.2?" I asked her. "It's almost all mental." She told me. My first marathon, at age 20, was not pretty. I relied (almost) solely on youth, the hills in Ithaca, and the fact that I was in good running shape. I did no cross-training whatsoever, and most of my runs were done after a night out. I ended up with bells palsy three weeks out, never completing more than 16 miles before show time. Still, on November 1, 1998, I completed the 26.2 miles, yet ended up hobbling the last three, with a stress fracture in my left tibia, tendinitis in both knees and my worst time to date at 4 hours and 34 minutes. Needless to say, I was gun-shy to try again, in 2007 when my close friend, Lindsay, was planning on doing her first and asked me to join her. At the "ripe" age of 29, I had smartened up, and knew I needed to add some cross-training into my regiment. This is when I found yoga. Everything was right on November 4, 2007, I felt great, and finishing at 4 hours and 17 minutes, I had more left in the tank and knew I could have run the race faster. This is exactly what I set out to do, in 2010, when I ran my third marathon, at age 32, finishing in 3 hours and 50 minutes. First three marathons: pre-Sophia. Pre-being a fitness professional. And, pre-age 35. While I do believe age is just a number and we should not be confined by it, there are certain facts we just cannot ignore. Fact: after age 30 (yes 30), we lose a pound of muscle every year. Fact: All sorts of recovery- whether it be from an injury or from a tough or long workout- take longer as we age. I certainly noticed this fact this training season. Where at age 32, after an 18 mile run, I could do 6-8 miles two days later, this year, eight years later, I have found that while I am not sore, my legs are more fatigued and need lower milage a few days later. Which means, in turn, I need more time to train to get up to where I want to be. 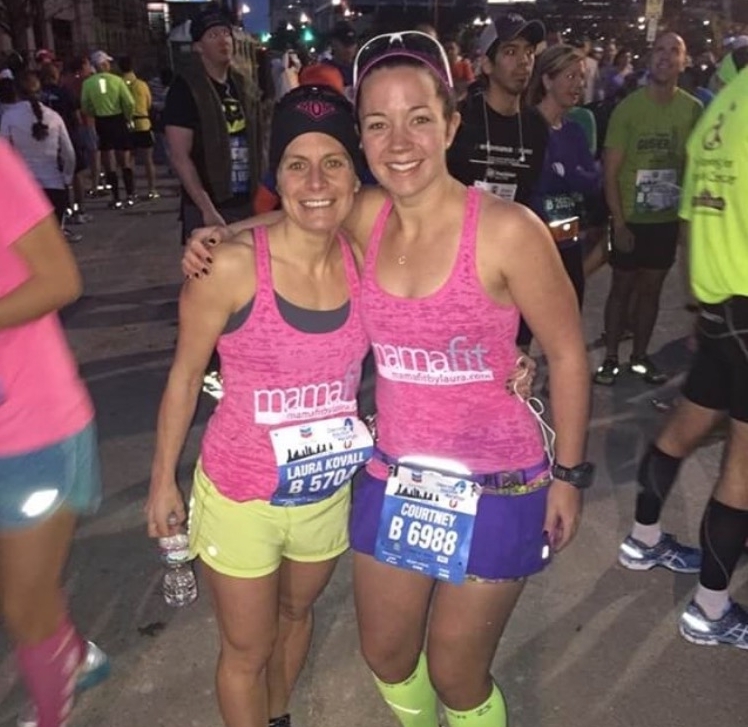 I have written about this quite a bit over the past two marathon training seasons; training for a marathon as a fitness professional and mother is a shift in lifestyle. Whereas my first three, I could run- or train- any time I wanted to, which meant early mornings and late evenings when the weather was hot- this is not always an option anymore. A kid- or caretaker gets sick- and you are squeezing in your lengthy list of other obligations with marathon training. This, along with what I wrote in the previous paragraph, means you need to train smarter, and be more focused and efficient. I mentioned earlier that "Everything was right on November 4, 2007" when I ran my second marathon. This was similar on January 18, 2015, when at age 37, post-Sophia, I ran my fourth marathon in 3 hours and 53 minutes. Just as "Everything could be right", "everything- or most things- can be wrong" which was the theme of last years training. It felt as though every long run was a struggle and I wanted to stop after 11 miles. When I was scheduled to do my mid-week shorter runs, it was mentally as if I was moving a mountain out of the way to get myself out the door and, frankly, sometimes I just didn't. And it showed; on November 5, 2017, as I set out for my fifth marathon, the first 15 miles were great, then severe leg cramping set in on the Queensboro bridge around mile 16, and the humidity and spitting rain the entire time caused severe dehydration. I had to significantly slow down my pace and walked/ran the last 6, finishing in 4 hours and 27 minutes. Upon finishing, I had the strangest feeling of not being tired, but my legs felt as though they could not move another inch. As I set out for number 6 this Sunday, twenty years wiser and twice my lifetime from the first, here is what I know. This training season was solid. I consistently ran 4 times a week, and incorporated yoga and cross-training. I have worked with a running coach on my form and breath. I have given my body time to rest and I have at times pushed myself. I have been consistently pacing 8:30-8:50 min/miles on my long runs, putting me in place to break - or finish- around 3 hours and 50 minutes. I have done long runs, short runs, hill work, speed work, I have run in 90 degrees with 100 percent humidity in the dead of summer, and 45 degree chilling rain. I could also tell you that, there still have been times I have wanted to stop; there have been times I have had to move a mountain to get outside the door, yet this year the mountain moved. What I cannot tell you is what will happen. What the weather will be like. What sort of aches and pains I may have as we get into higher milage. What “unknowns” could happen either on the course or in the days- or hours- leading up to it. But what I can say is, I have given my all for this particular training season- both physically and mentally- and have found a balance that brings me into the race feeling strong. And that I will thrive off the energy of the one of a kind crowds along the five boroughs as I run with the other 50,000 plus. Fitness Routine Disrupted? We Want to Talk to YOU!